It was the best of visits, it was the worst of visits, it was an act of wisdom, it was an act of foolishness… customer service is still king! Let me begin by saying that I don’t complain often. We’ve all been on the other end of that… a lot. But read the tale of three restaurant visits I had recently where I simply had to give feedback. Maybe it’s just been a string of bad luck lately, but having spent years in the business, I tend to like to let restaurants know when something goes wrong. I didn’t complain over Yelp or any review sites, either; I wrote polite emails via the restaurants’ websites. Read below, the tale of the experiences and the subsequent responses from the restaurants and see what you think. Spoiler alert: one handled it extremely well, one handled it just “okay,” and one dropped the ball big time. See what you think of the customer service that I got at these three different places! A lot of thought was put into this article and whether or not it should mention the restaurants’ names. In the end, I decided to mention their names, in part because these are big corporate-owned chains and a) should have consistency in food and service and b) a little negative feedback won’t hurt. I haven’t really been to BJ’s much… probably only half a dozen times in my life. I will say, I like the Pizookie, and the avocado egg rolls are ALMOST as good as the ones at Cheesecake Factory. This particular visit was on a Sunday evening. We were seated in the bar. Our server took a few minutes to greet us. He was pleasant, but not particularly friendly or engaging. As we sat waiting for our drinks, we noticed two other servers around us interacting with their tables, and one table was being greeted. The server told them about the happy hour specials, and generally was much more engaging and friendly. Hmm. Our table wasn’t told about happy hour. It would have probably changed our drink and appetizer order significantly. How disappointing. To our server’s credit, he did go into detail when we asked, after our drinks were delivered. Still, he was just basically going through the motions. Throughout the rest of the meal, the service was slow. Our drinks sat empty for far too long, the standard two-minute check-back was more like five or six, it took forever to get the check at the end and almost as long to get it processed. The next day I submitted some polite feedback through their website. You definitely want to reach out to a guest who has written an email because they’ve in effect given you a gift: the chance to fix a problem before they go and write a bad review. I’ve always liked Red Lobster. It’s sort of a cut above the typical fast-casual chain restaurant and it was always a little treat as a kid to go on my birthday or other special occasions. I haven’t noticed any decline in food quality over the years and consistency is a big deal for me. And those Cheddar Bay Biscuits – wow. We went during the Endless Shrimp promotion, but we didn’t know it because neither the host nor the server told us about it. Our server did end up telling us about it and a few other specials – after our meal, when the check came. Hmm. Also, the shrimp scampi that came in my two-item combo was curiously split into two dishes and gave the appearance of a three-item combo. Typically, scampi at Red Lobster would come in a single dish and lined up nicely; these were partially butterflied and I actually found an extra shrimp tail hanging out in the garlic butter. In any case, the two containers wasn’t what I was used to and so I wondered if our server entered three items instead of two. She was largely absent during most of the meal as well so I couldn’t clarify for almost 10 minutes (it wasn’t busy; it was a Wednesday around 7:00 pm. Maybe doing sidework?) Like BJ’s, the drink refills were slow in coming and she had a demeanor that suggested she would rather be somewhere else. I used the online survey to give some feedback. 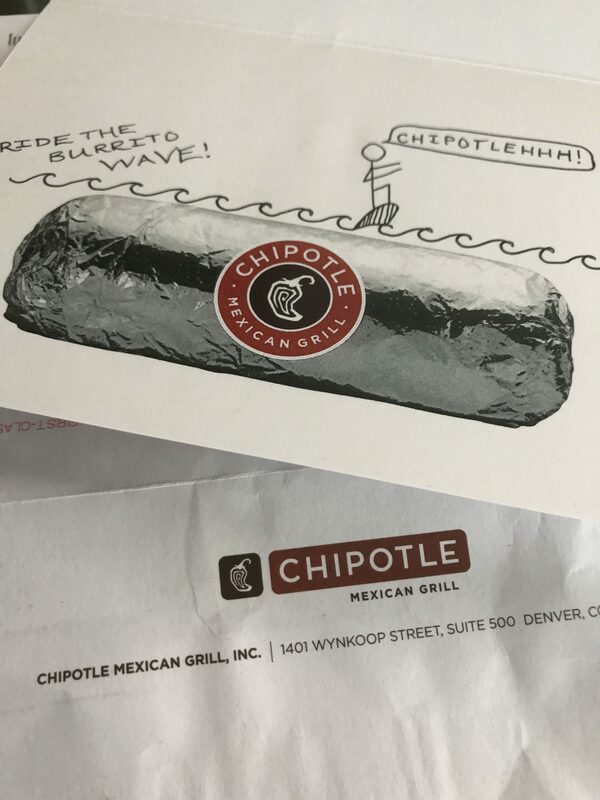 I’ve loved Chipotle since I was in college in Denver and tried them for the first time at one of their very first locations around the year 2000. 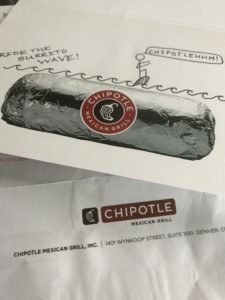 Their concept was pretty unique for a burrito place, and let’s face it – their menu is great. Simple but delicious, and the assembly-line setup, a la Subway, is awesome for monitoring your burrito being made. I always get the fajita veggies instead of beans in my burrito (red and green peppers and onions) and this time, I decided to try their new queso on the side with some chips – gotta love that lime flavor! As usual, the burrito was hefty and the chips were great. But the queso was grainy! I’m not usually a texture kinda guy but this just really detracted from the flavor of the queso, which overall was actually pretty good. I’ve heard much the same feedback from other people about the texture of it, which apparently is less noticeable if you get it IN your burrito. The second thing I noticed this time was the peppers were yellow instead of red and green, which changed the taste significantly. I hadn’t been to Chipotle in a couple months and was wondering if it was a permanent change. I wasn’t mad or disappointed. At all. I just wanted to give them some feedback, so I let them know about the graininess of the queso and the unusual yellow pepper substitution via their website. So here’s the point of the article. How do you think these three restaurants fared with their outreach to me? I’ve always been a total guest satisfaction guy so maybe I have higher expectations. You definitely want to reach out to a guest who has written an email because they’ve in effect given you a gift: the chance to fix a problem before they go and write a bad review. And the faster you respond and fix the problem, the less likely it is that they’ll write that review. Of course, once in a while, you’ll have that guest who will go and write a review on every single review site they can find, and then smugly send an email with links to those reviews. Hand-drawn or not? It looks like it, which sure shows they care. Chipotle: Home run. Maybe even a grand slam. I was contacted by phone within 24 hours, and had a very pleasant conversation with one of their reps from the main office. I wish I could remember his name. He explained that the queso was a work in progress and that they are listening to all the feedback from guests. He also explained that the yellow peppers were temporary based on availability in some markets. Okay, cool! He was really nice, apologized, and offered to send a couple burrito cards. Awesome! Unnecessary, but really cool of them. Above and beyond. A few days later they arrived, with a card that contained art that looked hand-drawn. It very well might not be, but it sure looks good! Will I be back? Of course! Would I have gone back without the gift card? Of course. But the gift card sure sweetened the deal and impressed me with their commitment to customer service. I even Tweeted to them to express my gratitude. This, ladies and gentlemen, is how you create raving fans. Red Lobster: Just “meh.” A manager at the store level contacted me a couple days after I submitted the survey. We had a relatively short but pleasant discussion about my experience. He thanked me for the feedback and said he would follow up with the server. I don’t recall getting an apology, nor did I get the impression he felt my feedback was valid. At least he called. And that was that. Will I be back? Sure. But not in a huge hurry. Maybe on my birthday, if I’m not already going to Benihana. BJ’s: Three weeks later and no response yet. Will I be back? I don’t know. As I said before, I didn’t go very often in the first place, and this certainly doesn’t make me want to run back. Email feedback is a gift. 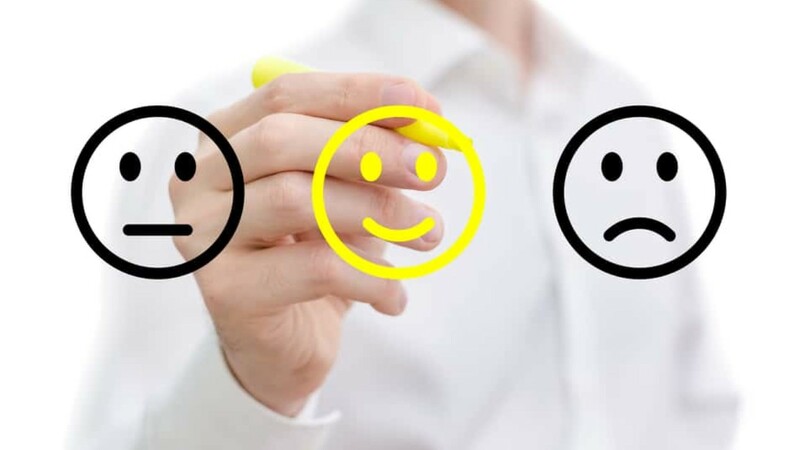 Take the opportunity to make things right and avoid a negative online review. Apologies are free, easy, and a necessity. The small extra effort of a gift card goes a long way to recovering a guest. Ignoring feedback can make a guest feel that you don’t care about their experience. A dedicated customer service person can sometimes do a better job of recovering a guest as opposed to a manager who often has a full plate of other duties just making the restaurant run. This is an important service we offer all our clients. So there you have it – a tale of three very different guest recoveries. What do you think? Let us know in the comments!